I do not know what troubles I may meet with on my way. I cannot guess what part I shall be called upon to play. I cannot see the pattern of my future destiny. I cannot tell what purpose God is working out for me. But this I know - whatever I may have to fight or face. He'll be there at every moment and in every place. I shall not dread the unmapped road or fear the great unknown. Wherever I may find myself - I shall not be alone. 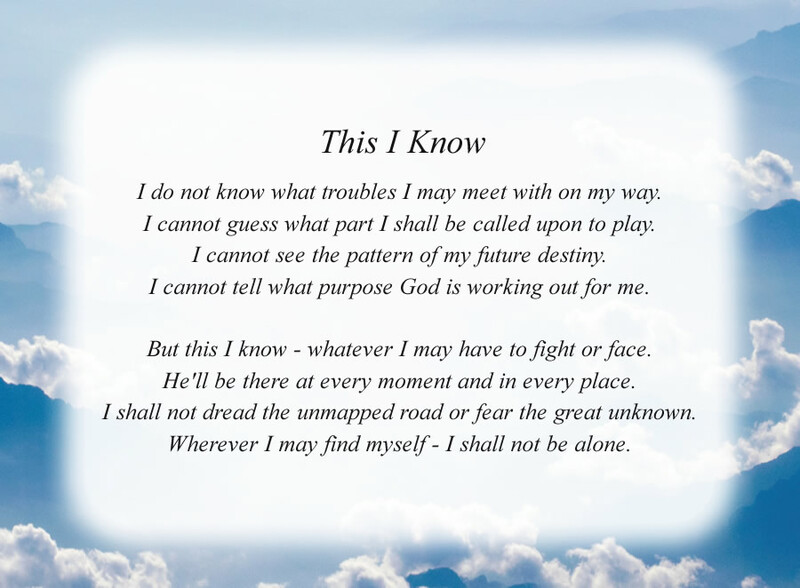 The poem, This I Know, is free and printable by opening or downloading using one of the three links below. One link is for the poem with the Mountain Clouds background as shown above. The second is for the poem with a plain white background. The third link is for the Mountain Clouds background without the poem, in case you would like to print a different poem on this background.